Bladder stones are small, dark mineral masses that form in the bladder—they develop when concentrated urine is left in the bladder. This concentrated urine is about 95% water and five percent minerals and waste products (i.e. salt and protein). Once urine becomes too concentrated, waste products clump together and form crystals or stones. Depending on the minerals the urine contains, it will vary in color, from yellowish-brown to deeper brown. An enlarged prostate gland: The prostate gland surrounds the urethra, which is a thin tube that transports urine from the bladder. When the prostate becomes enlarged, it will press against the urethra and interfere with normal urination. Weak bladder: The sides and walls of your bladder can become weak in certain areas. When this occurs, those weakened areas can form pouches and bulge outward. Urine has the ability to collect and store in these pouches. Infection or inflammation: Harmful bacteria may cause inflammation and lead to a urinary tract infection (UTI). UTIs are common causes of bladder stones. Damaged urethra: If the urethra is damaged or injured from disease, illness, or trauma, it may become narrow because of the infection and block the flow of urine from passing. Who Is at Risk for Bladder Stones? 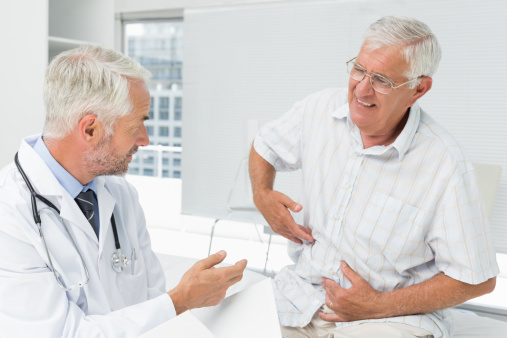 Approximately 95% of people who develop bladder stones are men—specifically older men who have previously had problems with their prostate glands. Men over 80 are at a much greater risk than younger men. However, men in their thirties who have lived in industrialized countries are more prone to consuming high-fat and high-sugar diets, which can influence the materialization of bladder stones. Ultrasound: An ultrasound will use sound waves to create images inside the body that x-rays may not be able to see. Urinalysis: A urinalysis test is used to examine your urine for crystallization, abnormalities, and infections. Spiral computerized tomography scan: This is a computed tomography (CT) scan, which checks for complications within the bladder. Intravenous pyelogram: A dye is introduced to the veins and moves throughout the body until it finds its way to the bladder. The dye highlights any abnormalities found in the bladder, and an x-ray is taken of the highlighted results. X-ray: An x-ray will show the inside of the bladder and most complications that are present. However, an x-ray may not show every stone that is present. You have likely heard of pineapple juice and rose water, but may be wondering what misri is. The medical term misri is a sugar candy lump or type of confectionary mineral (sweet mineral). To reap the benefits of this remedy, mix 10 milliliters (ml) of pineapple juice, 10 grams (g) of sugar candy, and 10 ml of rose water together and let it sit overnight. The next morning, drink it on an empty stomach. It will provide immediate relief to bladder stone symptoms. The scientific term for the white goosefoot plant is chenopodium. To get the best effects from it, grind 50 g of white goosefoot leaves in 125 ml of water and consume it for two weeks on a daily basis. This will help dissolve the bladder stones. The scientific term for horse gram is Macrotyloma uniflorum. It is a legume/seed and is an excellent source of iron. To get the full effects, you want to boil 6 g of horse gram and 25 ml of extracted radish juice in 125 ml water. After straining it, drink it first thing in the morning on an empty stomach. This will help break down the stones. Consuming the kernels from watermelon on a daily basis will help break down the stones so they can pass through the urine. Boil 20 g of vine leaves in a cup of water and filter it. Then mix in 20 ml of grape juice and drink it after dinner. Also known as calendula, marigold is an herbaceous plant and can be used in salads. For the best results, combine both into paste form and let it dissolve in a glass of water. Drink it once a day until the stones go away. Consume 5 g per 1 ounce of extracted onion juice on an empty stomach. The bladder stones will dissolve quicker if taken on a daily basis. Grind 3 g of cucumber kernel seeds, 3 g of American cucumber kernel seeds, 4 g of horse gram, 6 g of melon kernel seeds, and 4 g of puncture wine (Tribulus Terrestris, which is a plant). Boil the ingredients in 180 ml of water and add sugar to taste. Consume it twice a day. Black salt is a type of rock salt condiment and aluminum chloride (kasarin) is a substance that is used for many things, including improving bladder and kidney function. For best results, sprinkle black salt and aluminum chloride onto cucumber slices and consume on a daily basis for one month. Bano, M., “Natural Tips for Urinary Bladder Stones,” Natural Fitness Tips web site; http://www.nftips.com/2014/01/natural-tips-for-urinary-bladder-stone.html, last accessed September 15, 2015. “How to Prevent and Get Rid of Bladder or Kidney Stones?” Simple Remedies web site, August 29, 2011; http://www.simple-remedies.com/home-remedies/kidney-stones/bladder-stone.html. Lee Macon, B., et al, “Bladder Stones: The Bad, the Ugly, and the Good,” Healthline web site, July 25, 2012; http://www.healthline.com/health/bladder-stones#Overview1.